Despite the rising costs in Radiation Oncology, the impact of health economics research on the practice of radiotherapy is unclear. The aim of this study was to perform a systematic review of economic evaluations in Radiation Oncology to identify trends in the quality of the literature over time. A systematic review of Radiation Oncology economic evaluations published in the English language up to 2014 was performed using the Medline and EMBASE databases. A standardized form of items, based on the CHEERS guidelines (recommendations for appropriate health economic evaluations) was created for data abstraction. Data abstracted included author, journal, year, impact factor, country of study, conflict of interest, disease site, radiotherapy modality, new technology used, treatment intent, comparators, analytic time horizon, discounting, sponsorship, currency year and type, payer perspective, sensitivity analysis, incremental analysis, data source for utilities, cost-effectiveness threshold, use of cost-effectiveness acceptability curves and basis for economic analysis. We also assessed for inclusion in the Tufts CEA registry (a comprehensive database of over 4000 cost-utility analyses) and the National Health Sciences (NHS) economic evaluation database. Tufts registry quality scores helped inform qualitative assessment of included studies. Studies were stratified into 3 time periods (pre-2005, 2005-2009, and 2010-2014). The Chi-Square Trend test and the equivalent linear trend test were used to determine significant changes over time, with a p<0.05 considered statistically significant. Of 726 abstracts identified, 102 were eligible for inclusion. Most studies were North American (70%) and spanned multiple disease sites with prostate (19%), breast (18%) and gastrointestinal (13%) being the most common. Study analyses were based on a model (62%) or clinical trial (28%). Many studies lacked a conflict of interest (COI) statement (66%), a sponsorship statement (48%), a study time horizon (35%), or the use of discounting (30%). Over time, there was a significant increase in the reporting of a COI statement (p<0.001), incremental analysis (p<0.001), cost-effectiveness threshold (p=0.003) and a cost-effectiveness acceptability curve (p = 0.049). Non-significant trends were observed in the reporting of sponsorship, currency type, currency year, payer perspective, analytic time horizon, discounting, sensitivity analysis and utility weight source. Inclusion within the Tuft CEA registry (p=0.095) and NHS database (p=0.558) remained constant over time. 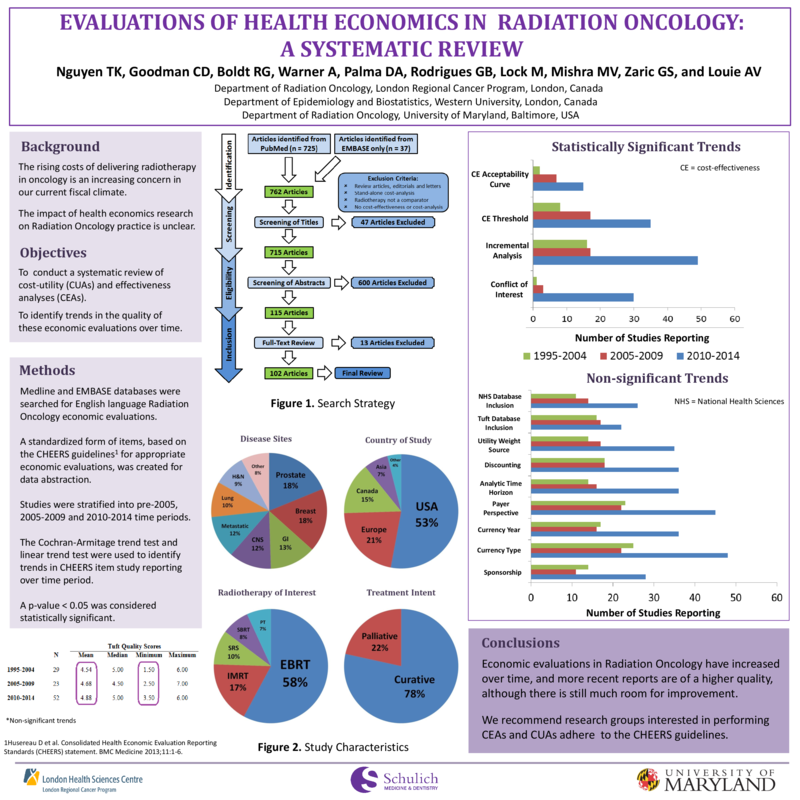 Economic evaluations in Radiation Oncology have increased over time, and more recent reports are of a higher quality, which may lead to better-informed decision making. Further research is needed to evaluate the impact of this research on clinical practice. 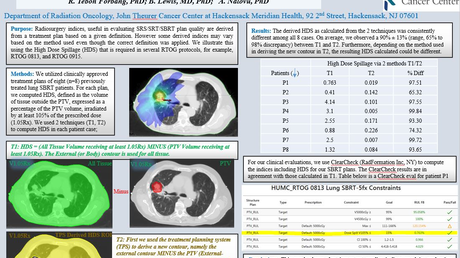 This is an open access poster distributed under the terms of the Creative Commons Attribution License, which permits unrestricted use, distribution, and reproduction in any medium, provided the original author and source are credited. Share this poster with up to 10 of your colleagues!